When I was around eight years old, my mom brought home a leaf in a jam jar which was covered in butterfly eggs. At the time, we were reading Gerald Durrell’s ‘My Family and Other Animals’ together, and I think she was hoping to cultivate two mini-naturalists in the house. Unfortunately, she overlooked our zeal for feeding the tiny caterpillars that emerged from the eggs. According to Eric Carle’s ‘The Very Hungry Caterpillar’, caterpillars thrive on a diet of fresh fruits and the occasional piece of chocolate cake. With that in mind, Becky and I collected a variety of leaves and stuffed them gleefully into the jam jar, watching with joy as the ravenous little caterpillars began munching away at the leaves. Of course, the next day, all the poor little caterpillars were dead, poisoned by our toxic love! Our mother, who until she saw our tearful little faces had no idea what we had done, told us that butterflies laid their eggs only on plants which bear leaves that are suitable for their caterpillars to eat. Which brings me to the subject of today’s book review (courtesy of MPH Bookstore, who was kind enough to send me a copy to review): Maxilla by local author Lianne Ong. Because if you can be Batman, you should always be Batman. 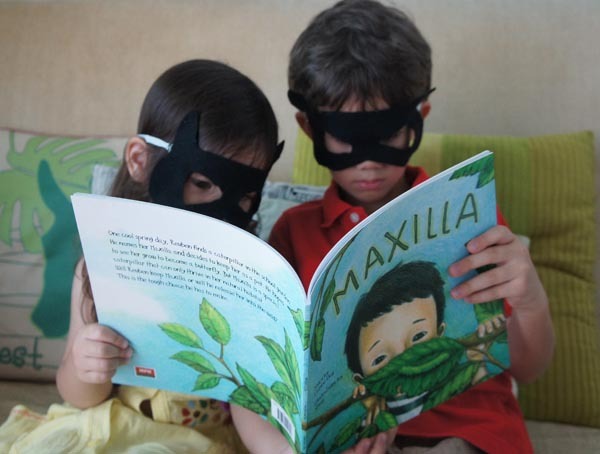 Maxilla, is a story based on the true life experiences of Lianne and her son, Reuben, when they were living in the US. In this book, Reuben finds a green caterpillar at school and names it Maxilla (which, by the way, is the scientific term for the mouthparts of an arthropod – such an appropriate name for a very hungry caterpillar!). He takes Maxilla home, only to realise that he is unable to adequately care for the creature. Reuben learns during the course of the story that love sometimes means relinquishing the things that are held most dear. This theme of sacrificial friendship is one that is also covered in other children’s storybooks like Laura’s Star by Klaus Baumgart and Lost and Found by Oliver Jeffers, which are two of our favourites. The book is beautifully illustrated by Lim Shing Ee, a Singaporean artist based in Japan and each page is covered with sweet sketches in colour pencil which adds to the innocent, childlike tone of the book. The pictures, coupled together with the handwritten font, make the whole book resemble a field journal or nature diary. It even has a few pages at the end of the book describing the life cycle of butterflies. It’s nice to see asian children depicted so beautifully in these illustrations. Unfortunately, the book does not include advice on how to observe or care for caterpillars in captivity but emphasises the maxim that children should leave wild creatures alone. This is something that I personally do not agree with, as I believe that a child’s curiosity about the natural world should be nurtured, albeit under parental guidance. A good book that promotes such responsible scientific study is Growing Frogs by Vivian French, where the development of frogs from spawn gathered from a local pond is keenly observed and recorded by a young girl under her mother’s supervision. Why is the ‘x’ in Maxilla so dark? Is it a sign? Additionally, I found that the handwritten font, although interesting and unique, seemed rather cramped and uneven. In certain places, the letters even seemed to run into each other which made it difficult for my son, an emergent reader, to decipher the words. An example of this is the word ‘Internet’ (see in the picture on the left) where the ‘e’ and ‘r’ are so close together that it looks like an ‘a’ at first glance. The uneven lettering is also very distracting to the eye and can make a page of words appear jumbled and confused with some letters seeming to be emphasised more than others. 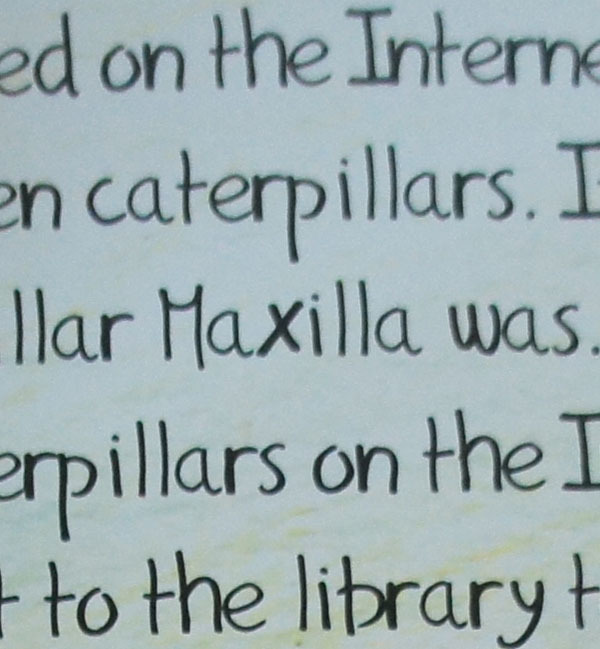 You can see this most obviously in the ‘x’ in the name ‘Maxilla’ which is darker than the rest of the word, so that it looks like ‘Maxilla’. For this reason, I would recommend this book as a ‘read aloud’ storybook, and is not suitable for dyslexic children or emergent readers. However, I still think the book is definitely worth a read! The book did help J and Little E want to know more about butterflies and find out more how they grow and transform from caterpillars. It is most certainly a good book for introducing children to the natural world and showing them how they can learn more about the little creatures that they may meet in the park by doing their own research and by talking to experts. Here is a brilliant web series about butterflies from Smarter Every Day which really easy to understand and fun to watch. J and Little E learned so much about butterflies and their life cycle. I am also seriously considering taking the kids to Oh’ Farms to explore the Butterfly Lodge and they could even bring home one of the Oh’ Farms butterfly kits which come with instructions on how to care for caterpillars and nurture them to adulthood! Or we could even try and make our own butterfly kit at home. Debs G rates Maxilla: One nice green leaf and no chocolate cake! Maxilla retails at SGD$10.60 and is available worldwide at MPHonline.com, as well as at all major bookstores in Singapore (Kinokuniya, Times Bookstores and MPH Bookstores). 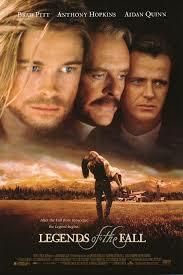 So last night, The Husband (henceforth known as TH) and I rented out the 1994 movie, Legends of the Fall. Why did we choose this movie? 1. I hadn’t seen it before. 2. I was planning to see it in the theatres in 1994 but what with one thing and another, I just never got round to it. 4. TH said that it was a good movie and he was willing to watch it again with me. And also, he owes me because I watched Primer with him. I: yah yah yah enough talking and BRING ON THE HANDSOME BOYS! TH: There’s only one handsome boy in this film. I: The other guy is handsome too, right? TH: No. He is not. I: Well, I stand corrected then. I: That boy is asking for trouble, bringing this girl home when he has two big brothers milling around the farm looking good all day long. Why doesn’t he just marry her already? TH: We already know she’s going to turn out to be a tart because she dumps Arthur for Lancelot in the next show. Typecast, I say. TYPE. CAST. I: Oh look well now the Germans have done it. He’s going to go all Dances with Wolves on them. Why didn’t they just send him for the recce in the first place? I mean, he managed to get in and wander around the camp covered in blood and scalps without getting killed. TH: Will you just calm down? I: NO! That guy is being a scum! And he’s doing all scummy things! And being scummy with it! The scum! SCUM! TH: We already knew from the beginning that he was going to be scum. I: Well then why didn’t you doing anything about it? Don’t just sit there, DO SOMETHING! He’s making Sabrina cry! DON’T CRY SABRINA FAIRCHILD! TH: It’s ok. Indiana Jones will save her. You shouldn’t expect too much from this guy anyway. We know he’s secretly a vampire. I followed all of the rules, man’s and God’s. And you, you followed none of them. And they all loved you more. Which I think is oftentimes very true. People with charisma are hardly ever totally square and straight-laced. TH says it’s because we are naturally drawn to those with unpredictable natures because they are just more interesting, and gaining that person’s affection or friendship feels so much more special and rewarding because it is more of a challenge to achieve. Like taming a wild animal, I suppose. But really, it’s got nothing to do with being square or octagonal, being tame or wild. He was just the prettier one with the prettier smile. 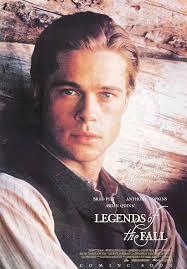 It is Brad Pitt, after all. Debs G rates Legends of the Fall: 6 out of 10 stars! Good for a girly night involving popcorn that you can throw at the screen at appropriate moments. 1. He amuses me. And he has lovely hair. 2. Two words: Absolutely incomprehensible. 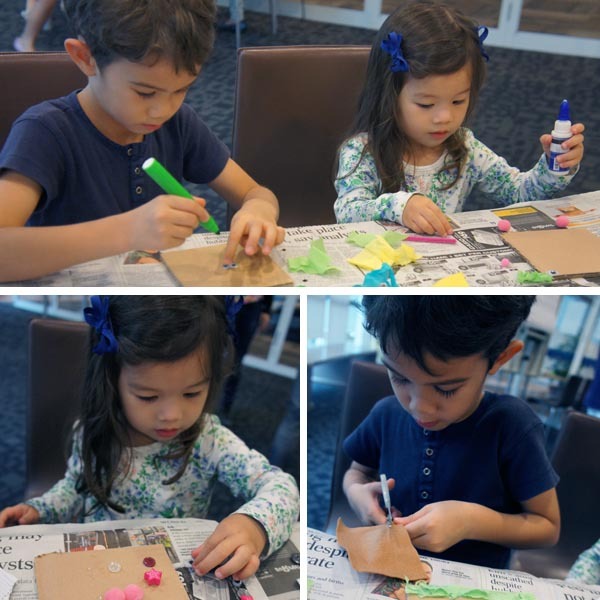 A few weeks ago, Pamela from The Tan Family Chronicles invited me to attend a storytelling and craft session at the Jurong West Public Library, organised by Little Captains At Play. Little Captains At Play is a national play movement which aims to create a more balanced childhood for preschoolers through spontaneous, unstructured play. 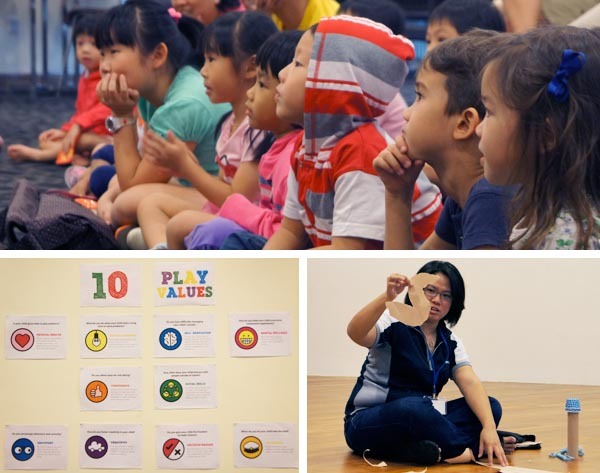 The project is managed by a group of final year students from Nanyang Technological University, and they hope to inspire parents to allow children to be captains of their own playtime, which is an important part of a child’s learning and development. I wholeheartedly agree that open-ended playtime is an important part of learning and development in a child, and encourages problem solving and creative thinking, which in turn leads to a more adventurous and confident child. This is why I always prefer toys like Legos, building blocks and wooden toys – basically any toy that does not play by itself – to electric doodads that have a limited function. At the Jurong West Public Library, Pam started off the session with an interactive storytelling segment called ‘Tear & Tell’. Basically, the storyteller works together with the children to name and identify random shapes torn out of a sheet of paper, and then invents a story linking the shapes together. 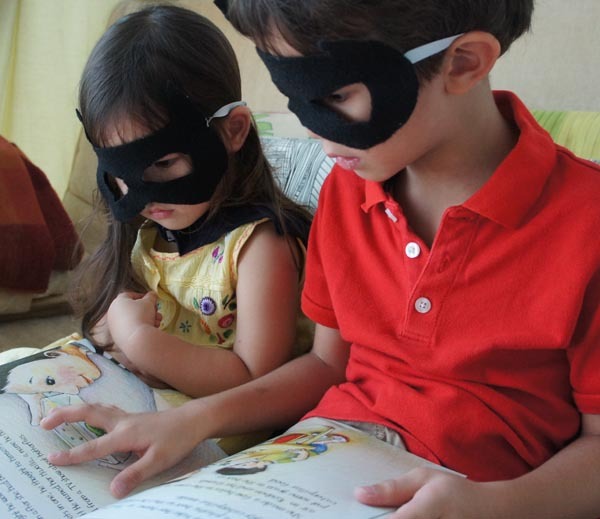 What an innovative way to discover a new story together! 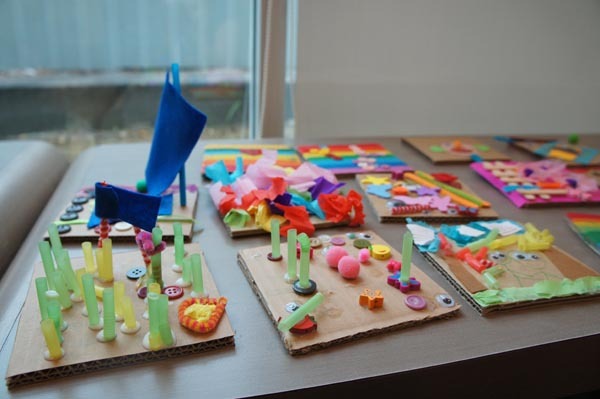 Afterwards, each child present was given a square of cardboard and a seemingly endless supply of craft materials to create anything their minds could conceive. J and Little E threw themselves into cutting, gluing and decorating these little tiles, which will eventually become part of a huge PLAY! Mosaic showcasing all the efforts of hundreds of children in a huge 3D display. The kids really enjoyed themselves, especially with the crafts and they are excited to find out where their tiles have gone, so I will probably pop down to the Back To Play! event which is this weekend, just to show them the PLAY! Mosiac. The Back To Play! event is a huge play festival with tons of fun hands-on activities for all the family. There’s going to be a huge fabric maze, craft stations, musical performances and talks for parents as well. Best of all, admission is free! For more information on Little Captains at Play, check out their website and Facebook page! J and Little E celebrate their birthdays very close together, and one of the joys of having a birthday that falls within the school term is having the chance to celebrate one’s birthday in class. However, with public awareness of food allergies on the rise, many of the preschoolers at J and Little E’s kindergarten have to adhere to very strict diets. This poses a challenge for parents who want to bring a special snack to school as a treat for all the kids. Usually, the preschoolers who have multiple allergies are left out of the celebrations, watching forlornly in the corner as everyone else tucks into a delicious store-bought cake with multicoloured icing. Since Becky suffers from a peanut allergy, I like to try my best to bring a birthday treat to school that every little kid will enjoy. 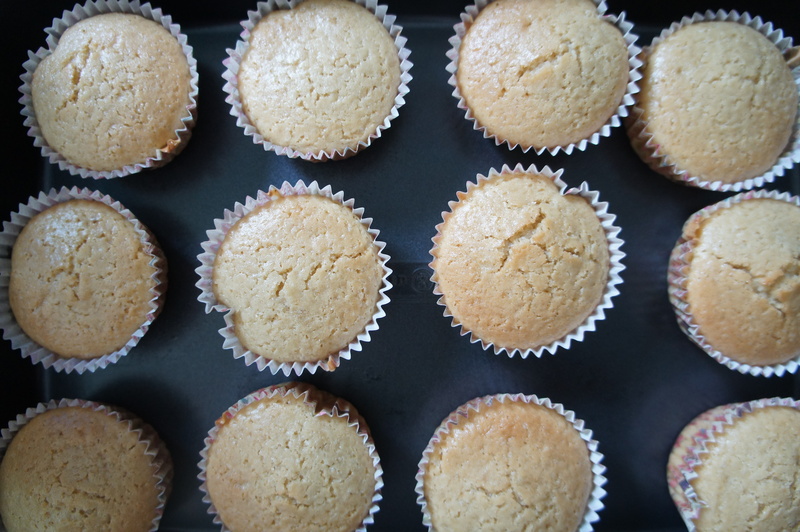 Here’s my recipe for Very Vegan Vanilla Cupcakes – suitable for children with lactose-intolerance, egg allergies and nut allergies – the most common allergies amongst children. To make the cakes fluffy without using yeast or eggs, vinegar is used as a substitute – this reacts with the baking soda to make lots of fizzy bubbles that make the batter fluffy! (SCIENCE!!!!) For this reason (science), this batter needs to be used immediately and cannot be kept in the fridge or freezer, as the tiny bubbles will collapse in the cold temperatures or dissipate with time. This means that the cupcakes will turn into crunchy – very, very, crunchy – “biscuits”. By the way, you can also substitute the flour in this recipe for gluten-free all purpose baking flour, for all the gluten-intolerant kids out there (there were some in J’s class this year). In Singapore, gluten-free flour is available at Cold Storage and Fairprice outlets – I bought mine from Fairprice Finest. Mix all the dry ingredients together (flour, baking powder, baking soda and sugar) in a large mixing bowl. Add in all the wet ingredients (soy milk, oil, vanilla, and vinegar) and beat until smooth. The batter is quite runny so don’t worry. Divide the batter into the cupcake cases. Fill each case two-thirds full – this is more than one would normally fill a cupcake case, but it is because these cakes do not rise very much. Bake for 15-20 minutes until they are done. 2. This version of cupcakes is a low sugar version (yes, 1 cup of sugar is ‘low’ in this case to combat the otherwise bitter-tasting vanilla extract which is used in liberal quantities instead of butter to give the cake a pleasant flavour) because I intend to add royal icing to the top of it. 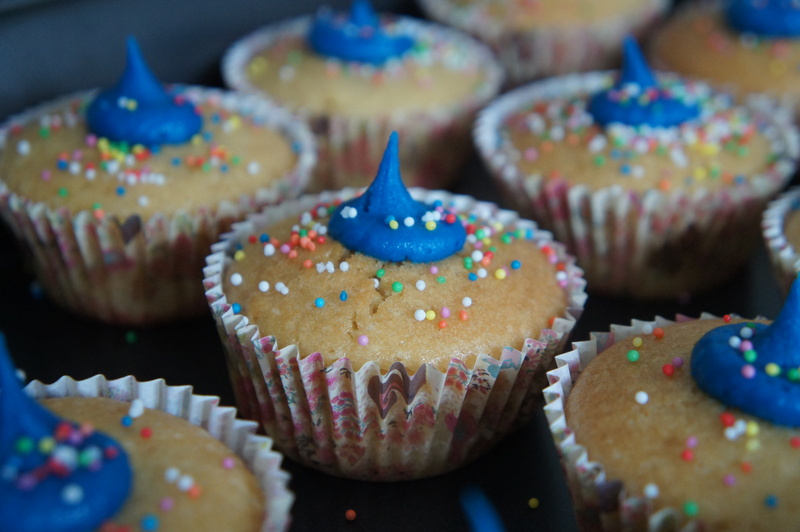 If you like your cupcakes to taste sweet, feel free to add up to 1/4 cup more sugar in! 3. You can use 2 cups of self-raising flour instead of flour with baking powder and baking soda – just remember that it will unsuitable for kids with gluten-intolerance and egg allergies! So, this weekend, I went to Gallery Serpentine in Newtown to check out their beautiful corsets. Gallery Serpentine is located beside Enmore Theatre at Shop 2/112-116 Enmore Road, Enmore, Sydney, NSW 2042. Also, until the end of March, Owls Well readers can get a 10% discount at the shop by mentioning Owls Well to the shopkeeper, or by using the promo code OWLSWELL on the Gallery Serpentine website at http://www.galleryserpentine.com/. Last weekend, one of my old school friends breezed into town and we were planning the usual meet up with the Usual Afternoon Tea and the Usual Chit-chat, when she suggested that we shake things up a bit and try a session at Roomraider! 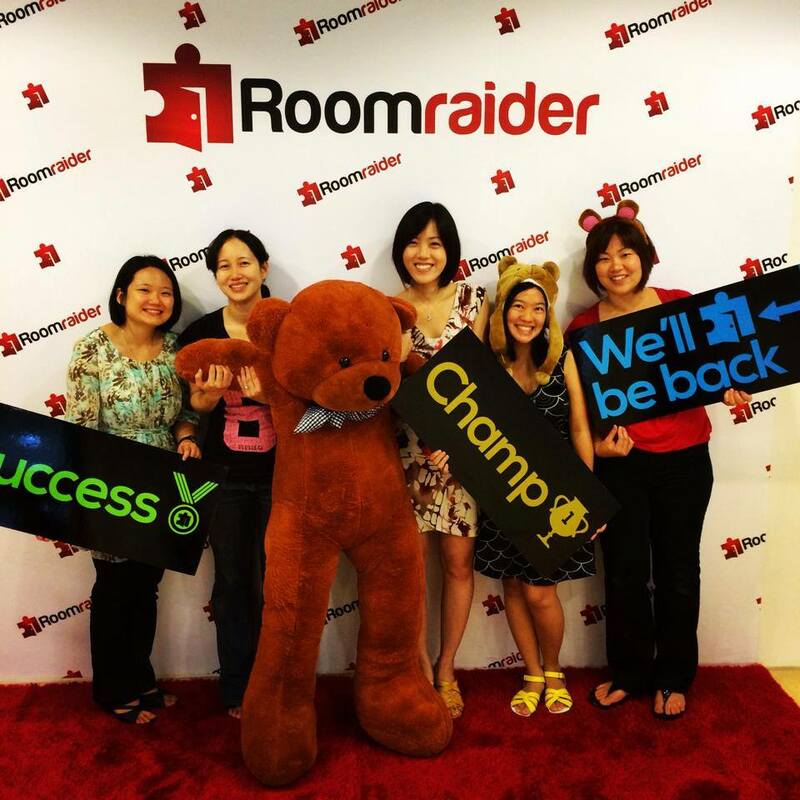 Roomraider is one of the few escape games that have been popping up in Singapore in the last year or so, and is essentially a live-action puzzle game combining riddles and simple physical tasks, with the aim being to escape from a locked room (think Crystal Maze!). Teams of up to 8 people get 45 minutes to make a successful exit from the room (with the option of calling in hints from the Roomraider Game Masters if you get stuck!). 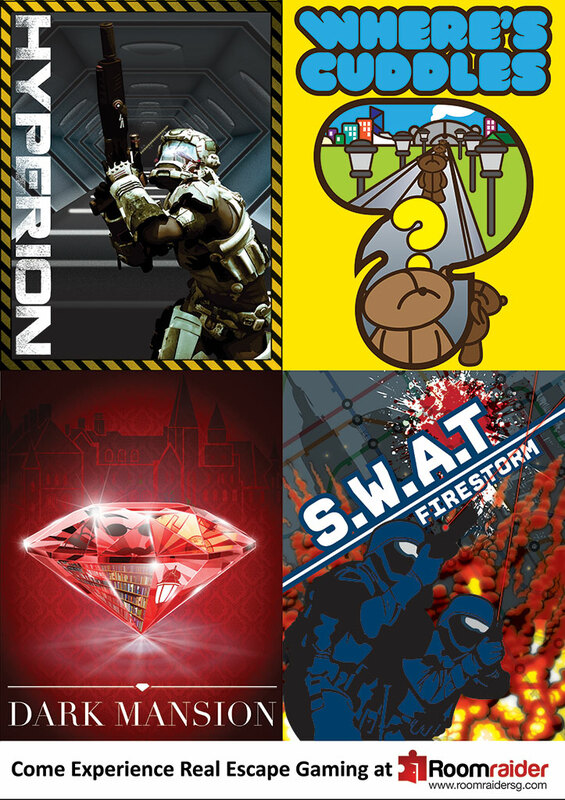 At the moment, there are four themed rooms, each with a different story and objective. Each room has been put together with painstaking detail by the Roomraider graphic designers, sound engineers and puzzle masters, in order to create a truly immersive experience. I talked to the Roomraider Dudes (who happened to be old schoolmates of mine! Small world! ), and they intend to expand their collection to seven game rooms, and then rotate the games to keep it fun and exciting. I really liked the idea of being able to step into a different dimension for an hour and have a little adventure with my friends (and live out all my Lara Croft fantasies), so I was really excited about it. I mean, we could be part of a SWAT team or professional cat burglars! I made babysitting arrangements for J and Little E, then off I went to Orchard Central for funtimes and adventure. When I got to Roomraiders, I found out that Hyperion (the game where you get to explore a space station) was already booked out by a family with two pre-teens in tow. We had the option of sharing the room with them, which would have been really fun in different circumstances, but since our primary objective was to have a fun girly afternoon out, we decided to be antisocial and try a different room. The room that we went with in the end was ‘Where’s Cuddles?’. Where you get to enter the magical, magical world of teddy bears and find your favourite teddy who has gone missing. My initial reaction was to look at the Roomraider Dudes suspiciously (because I am a very suspicious person) and ask them pointedly, “Are you offering us this room because we are girls?? ?” The Dudes just laughed in my face and told me not to underestimate the awesomeness that is Teddy Bear Land. And yes, they were absolutely right. We successfully found Cuddles and escaped from Teddy Bear Land! Can you? I really think that Roomraider is brilliant fun for groups, families with school-aged kids or teens and even for couples looking for something different to do on a date! I can imagine that the rooms are brilliant for parties or corporate team-building events. I am now trying to convince my husband to take me to the moon or maybe steal a precious jewel with me for our anniversary this year. At SGD$22 a person (SGD$28 on weekends), I think that it’s worth every cent. You can find Roomraider at their website or on Facebook.